Spoof metal legends Spinal Tap are to reunite for a very special world tour. It will consist of one night in London. To mark the 25th anniversary of the release of band's famed 'mockumentary' This Is Spinal Tap, the rockers will play Wembley Arena on 30 June. Explaining the limited range of the world tour, guitarist Nigel Tufnell says, "If we're going to do a world tour on only one night, at least it's this world". Bassist Derek Smalls sagely adds, "One night is not enough, and it's way too much." 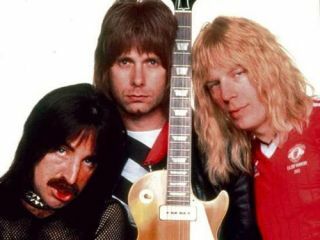 "One night is not enough, and it's way too much"
Despite rumours that Spinal Tap have been in the recording studio, their spokesman has announced that as they could not come up with any songs, "a new lost album" will be released this summer. Guitarist David St Hubbins claimed that the show was being held as a tribute to "all of our drummers who have passed on, either to their reward or to middle management at Sainbury's." The Folksmen (subject of the mockumentary A Mighty Wind) will serve as support on this one-night world tour. Tickets go on sale 9 April.